We’d love your help. Let us know what’s wrong with this preview of Best Friends by Samantha Glen. To ask other readers questions about Best Friends, please sign up. Is Best Friends still active? Annie Flos Yes, they have grown to include multiple shelters where you can adopt a pet or volunteer time. You can search Best Friend's Animal Society on the…moreYes, they have grown to include multiple shelters where you can adopt a pet or volunteer time. You can search Best Friend's Animal Society on the internet to find out more. Go to the best friends website and take a look at this amazing rescue sanctuary. In the early 80's a group of friends living in different parts of the country pooled their resources to buy property in Angel Canyon, Utah and moved there. The purpose was to create a sanctuary where unadoptable and special needs animals could live out their lives. The sanctuary grew to what it is today and animals have literally come from all over the world to live at Best Friends. Pretty amazing story about the dedication of the founders and lots of good animal rescue stories. After reading this book I decided that I needed to visit and work at the sanctuary, for it's history, mission, and founders are inspiring. The stories made me laugh and cry (and did I cry.) In 2005, I had the opportunity to volunteer at the sanctuary and hope to return, for it is the promised land for animal people. I now have several copies of the book in my classroom for my students to read. The perfect book for any animal lover! All happy endings but warning: you might shed a tear! I came across this book while I was in the midst of a huge dog story kick. It was an amazing and inspiring book. Of course it made me laugh and cry but I am always so impressed by people that have the courage and commitment to follow their dreams. The founders of Best Friends Sanctuary are incredible people - my hat goes off to anyone that is willing to work so hard to help those who cannot speak for themselves. After reading the book, I dreamt about visiting there and getting a chance to volunte I came across this book while I was in the midst of a huge dog story kick. It was an amazing and inspiring book. Of course it made me laugh and cry but I am always so impressed by people that have the courage and commitment to follow their dreams. The founders of Best Friends Sanctuary are incredible people - my hat goes off to anyone that is willing to work so hard to help those who cannot speak for themselves. After reading the book, I dreamt about visiting there and getting a chance to volunteer. I had a chance to do that when I was sent to a conference in Las Vegas in February. I was only there for 2 days but they were quite possibly the best two days of my life. Which is especially interesting when you consider I spent my vacation time walking dogs, picking up poop, etc! The compassion and generosity of the people working there is incredible. I cried when I left because I didn't want to go. I started planning my next trip right away and will soon be going back for a full week. Best Friends: The True Story of the World's Most Beloved Animal Sanctuary by Samantha Glen describes how Best Friends Animal Sanctuary originated and expanded. The book commences in 1982 when a group of friends pooled their resources and decided to purchase 3,000 acres in Kanab, Utah in order to build the animal sanctuary of their dreams. They had already outgrown the ranch they had purchased four years earlier in Prescott, AZ. 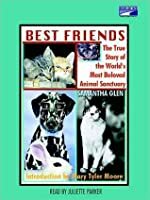 The author chronicles the first fifteen years of Best Friends and co Best Friends: The True Story of the World's Most Beloved Animal Sanctuary by Samantha Glen describes how Best Friends Animal Sanctuary originated and expanded. The book commences in 1982 when a group of friends pooled their resources and decided to purchase 3,000 acres in Kanab, Utah in order to build the animal sanctuary of their dreams. They had already outgrown the ranch they had purchased four years earlier in Prescott, AZ. The author chronicles the first fifteen years of Best Friends and covers all its trials, tribulations, and victories. The author introduces us to the friends who made their dream a reality and to the animals who were the reason for the sanctuary's creation. The book is full of heartwarming stories. My favorite story from the book is about two brothers, Tommy and Tyson. These two cats were living on the mean streets of Los Angeles and always walked with their tales entwined. The wonderful woman who fed them noticed that they were in danger as they slowly crossed a busy street. She finally realized why they walked side by side entwining their tails. Tommy was blind and Tyson was guiding him. She knew that they could not survive long on the streets and called Best Friends. The sanctuary did not hesitate, and Tommy and Tyson are now living the good life at the WildCats Village where there is no need to walk with their tails intertwined. The purpose of the founders of Best Friends was to create a sanctuary where all animals, including the unadoptable and those with special needs, could live their natural lives being cared for and loved. The intent of this book is to tell their story and to inform its readers of ways to make a difference in the lives of animals everywhere. The book not only includes ways to get involved with Best Friends but also ways to help in your own community. The Best Friends web site is a wealth of information on how to get involved locally and nationally. Best Friends is a must read for those who love animals. Some may put off reading it because of preconceived notions that it is filled with stories of animal abuse and neglect. There are a few stories of animal abuse, but the animals end up at Best Friends to live out their days in peace. The tone of the book is very optimistic. This is one of the best "feel good" books I've ever read. If you ever doubted the power of having a vision, or of having a diverse group, or of having commitment to a goal, or having shared values then you will want to read this book because that is how they created one of the world's best animal sanctuaries. Can you imagine taking in all kinds of critters in all stages of health and functionality, hundreds of them, with very scarce resources to support your efforts. That is exactly what this sma This is one of the best "feel good" books I've ever read. If you ever doubted the power of having a vision, or of having a diverse group, or of having commitment to a goal, or having shared values then you will want to read this book because that is how they created one of the world's best animal sanctuaries. Can you imagine taking in all kinds of critters in all stages of health and functionality, hundreds of them, with very scarce resources to support your efforts. That is exactly what this small band of animal lovers did over many years. But thanks to their persistence their efforts were recognized by others leading to funding and volunteers sufficient to enable their long term success. But although the problem of killing or abandoning unwanted pets is diminishing, there is still no end in sight of animals needing their lifelong protection. So read this book, but be prepared for some tears when you learn about the condition of some of the animals they found. But because we are talking about BEST FRIENDS, these sad tears will turn to ones of happiness. There have been many great accomplisments in our country; this is one of them. I learned about Best Friends sometime around 2005, I think. I fell in love with their mission and visited Kanab in 2007. My mom joined me on the trip as I think she feared I'd follow through on my threat to quit my job and move to the middle of nowhere and take care of dogs. The sanctuary was amazing. I just wish I had thought to do some volunteer work while there. Over the years I have donated to them when I could. Last year I was digging through a bin of books at my job's sample sale. Every boo I learned about Best Friends sometime around 2005, I think. I fell in love with their mission and visited Kanab in 2007. My mom joined me on the trip as I think she feared I'd follow through on my threat to quit my job and move to the middle of nowhere and take care of dogs. The sanctuary was amazing. I just wish I had thought to do some volunteer work while there. Over the years I have donated to them when I could. Last year I was digging through a bin of books at my job's sample sale. Every book with a dog on the cover went in my bag. I didn't even read the title, much less the description. When I got home and looked at my finds, I was excited to see that I one of the books I picked up was about Best Friends. I tend to procrastinate reading non-fiction (for fear that it will be dull), which is why I just got around to reading it. This was a phenomenal read! For starters, it's a non-fiction book that reads like a fiction book. Secondly, it is just absolutely amazing to picture the humble beginnings of an organization that is well known among animal lovers and that was instrumental in rescuing a number of the Michael Vick dogs a few years ago. I loved how the stories of the animals helped to tell the story of the sanctuary, bringing the factual account of the organization's history to life and painting a clear picture of the love and passion the founders have for animals. My only criticism is that the book stopped nearly 15 years ago. Despite being a supporter for the last 10 or so years (has it really been that long? ), this book brings a completely different perspective to the group's evolution. Take a look... You can see that almost everyone rated this book 5 stars!! Yep, there is a reason because it is an inspiring true story of how a few dedicated people came together and made this sanctuary a success. I purchased the book at the visitor center after taking a tour of the 300 acre site. As an architect and planner, I was impressed with the facility. What can I say, I am a sucker for someone helping an animal in need. This book chronicles just such folks. this book was really inspiring. I am glad there are people like this in the world. I don't know that I believe in psychic cats...but it is still a fun book to read and I think that kids would enjoy it too..
Great story on Best Friends animal sanctuary and how it rose from an idea to a successful place for animals. Heart warming stories on some of the original founders, too. Most inspiring book I have EVER read. Love, love, love it!! These people gave up everything to make this wonderful, awesome, amazing place happen! This is a must read!! Not only have I read this, we visited BFAS!! Excellent read!!!! Best Friends Animal Sanctuary is a wonderful place for many animals! Great stories of rescued dogs and cats and great people who take care of them! Best Friends is the uplifting story of the 1982 founding and early years of what has become the nation's largest no-kill animal sanctuary. The tenor of the book is optimistic and filled with the can-do attitude of its founders, and I was pleasantly surprised that the heartbreaking animal stories did not digress into a militant, PETA-like attitude. 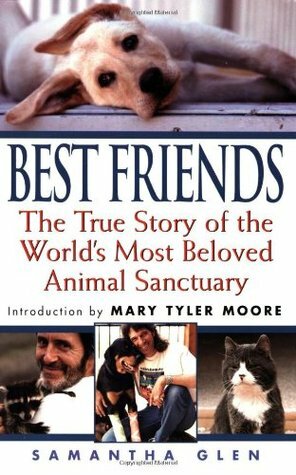 Additionally, I find it admirable that the fulfillment of the founders' vision was the result of their personal generosity of time, money, and love; Best Friends is the uplifting story of the 1982 founding and early years of what has become the nation's largest no-kill animal sanctuary. The tenor of the book is optimistic and filled with the can-do attitude of its founders, and I was pleasantly surprised that the heartbreaking animal stories did not digress into a militant, PETA-like attitude. Additionally, I find it admirable that the fulfillment of the founders' vision was the result of their personal generosity of time, money, and love; they were not afraid of hard work, pinching pennies, and creative thinking to accomplish their goal. Because of this old-school attitude, combined with helping animals, I find myself drawn to the sanctuary and could easily envision a working vacation at Best Friends. Lastly, a word about the excellent writing by Samantha Glen. Rarely have I read a book so engaging and well written! I would add extra stars if possible. Ms. Glen has a gift, and I hope she continues writing long into the future. This book made me laugh out loud, cry out loud and everything in between! It is a true story of how Best Friends Organization was founded and you cannot go wrong by reading this book. I loved all the stories about how some of the animals came to Best Friends and the role they played while they were there. The human stories in between were just as good but in a different way of telling the love for the animals that they had to take care of and friends they met along the way. What really played to This book made me laugh out loud, cry out loud and everything in between! It is a true story of how Best Friends Organization was founded and you cannot go wrong by reading this book. I loved all the stories about how some of the animals came to Best Friends and the role they played while they were there. The human stories in between were just as good but in a different way of telling the love for the animals that they had to take care of and friends they met along the way. This has been on my reading list for a Loooong time. I was afraid it was going to be full of sadness, but instead it was joyful to read. The founders of this now worldwide known organization had such unconditional love for all animals, and I believe God helped them along to provide this sanctuary for animals in Utah. I really enjoyed this book. I've been a supporter of this organization since 1996 and I plan on visiting in 2019. The book was great reading and never boring. I know that anyone who cares about animals will enjoy this book and feel the hope and love shared by the author and people who make Best Friends possible. An absolute heartwarming story of the love for all animals by the founders of the sanctuary. I did not want this book to end. I would love to visit their sanctuary if it wasn't for having to be gone from my own furkids. I keep up with their stories through their magazine and the dvd's of Dogtown and the videos on youtube. This is a "keeper" for animals lovers' libraries. My husband and I visited Best Friend several years ago. We we're so impressed we went back the next year and volunteer ed for a week. It was great reading this book and learning more how Best Friend s came t o be. We love animals and find stories about helping them is so rewarding. These folks are trying to deal with the reality of animal rescue by saving those that can be saved in the best possible way. Not all people who offer a home to a rescue animal really fulfill their obligation and this organization seems to keep track of where their rehomed friends go. Great story of a fantastic group of people who have saved many many many animals. I have contributed to "Best Friends" ,but never knew how it got started. A definite must read for animal people. If you want to read about the passion of people to take care of animals, this is the book! Tells all about the dedication, hard work and love of people to provide for animals that might not have had a home - or a life - otherwise. I enjoyed this book. I just wish it had more animal stories in it. The majority of the book dealt with getting the sanctuary up and running, the problems associated with it, and the people involved. I have never cried so many happy tears when reading a book. Absolutely beautiful and inspiring. If you’re an animal lover, this book is a must read.